Bacharach is a lovely town on a scenic stretch of the Upper Middle Rhine Valley. In this UNESCO World Heritage Site, castles sit on every hilltop and small towns exult in charm and wine. The river is lazy, the hillsides are rich in vineyards, and the town is full of half-timbered buildings and winding cobblestone streets. It is one of Germany's best-preserved medieval towns. Germany has many of these enchanting villages on the river, but this is the only one Victor Hugo described as one of the "world's prettiest towns". This area was originally settled by the Celts and known as Baccaracus or Baccaracum. This name references Bacchus, the god of wine. And indeed, the area has been known for its wine for as long as it has been in existence. Its strategic location on the river made it ideal for gathering tolls of boats passing by and led to the development of its castle high on the hill. It was also a shipping station for exporting the many types of wine found along the Rhine. Some of its fortifications can still be observed today and the river still brings travelers from far off places to enjoy its views and wine. The town is located 50 km from Koblenz and 87 km (about an hour and a half) from Frankfurt. It is in the Mainz-Bingen district in Rhineland-Palatinate, Germany. Bacharach is located on the left bank of the beautiful Rhine Gorge. It is divided into several ortsteile stretching up from the river to the top of the hill. Bacharach is well-connected to the rest of Germany as well as greater Europe. The Frankfurt–Hahn Airport (HHN) is 38 kilometers (40 minutes) away and the main Frankfurt Airport is about 70 km (1 hour). You can also reach it by train. There are direct trains from Koblenz and Mainz leaving hourly (and occasionally trains from Cologne). If you arrive in Frankfurt, expect the journey to take about an hour and a half by train with a change in Mainz. There is also a scenic line, Rhine Valley Railway, that follows the river. If you're driving, take the Bundesstraße 9 (B9) about 16 km north of the next biggest town, Bingen. But the most enjoyable way to arrive in Bacharach is by boat. Service runs regularly to Bacharach on the Köln-Düsseldorfer-Rheinschiffahrt (KD) line. It connects the town with Cologne and Mainz. There is also a cruise line called the Bingen-Rüdesheimer between Rüdesheim and St. Goar. Here are the nine best things to do in Bacharach. This is the ideal village on the Rhine river. Half-timbered houses line the narrow streets as they wind through the old town. Most buildings were constructed before the sixteenth century and are appealingly crooked. A small creek flows into the river and stone bridges provide picture-worthy backdrops. Unlike some other, larger, more well-known towns on the Rhine, Bacharach remains quite sleepy. While locals expect tourists to wander their streets with a camera at the ready, they seem quite welcoming towards ausländer (outsiders) who can appreciate their special place in the world. Walking up from the water, Wernerkapelle is the symbol of Bacharach. This elegant sandstone ruin is a marker on the way up to the castle. Admire the Gothic clover-leaf-shaped design that is still standing after its roof collapsed in 1689 as a result of debris from the French blowing up the castle. To find the Wernerkapelle, follow the stone steps and signposts that lead to the site. Continue up the path about 10 minutes to approximately 160 meters (520 ft) above sea level and you'll find Burg Stahleck. Built by the archbishops of Cologne in the 12th century, this castle protected the town and collected tolls from trade passing by on the river. The castle was heavily fortified and surrounded by a partial moat but was still conquered several times over the years, like the aforementioned destruction by the French. It was rebuilt in the 20th century and today, it is not nearly so impenetrable. It is open to the public as a jugendherberge (hostel). Along with the typical bunk beds for 168, there are private rooms fit for a family and a shared playroom. From the windows of the castle and the open courtyard, guests can admire the breathtaking views of the river. Built on the orders of the Archbishop of Cologne, it was destroyed in the late 17th century but rebuilt in the 20th and is now a hostel. 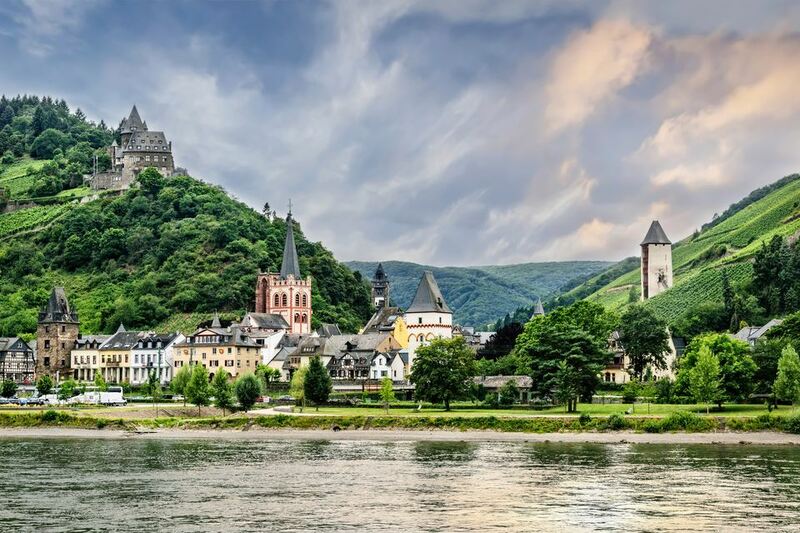 St.Goar: This quiet town is the entry point for the ruins of Rheinfels Castle. Marksburg Castle: This princess style castle is one of the few castles that have never been destroyed. Schönburg: Yet another castle in the seemingly endless line of castles on the Rhine is above the medieval town of Oberwesel. Today, it is a luxury hotel. Despite Germany's reputation for beer, it is all about the wine along the Rhine. The area is renown for its white wines, particularly Riesling. The importance of wine in the Rhine is hard to miss. Every steep hill is carefully terraced and vineyards line both sides of the river. The best three vineyards in Bacharach are Wolfshöhle, Posten and Hahn. Visitors can buy these wines throughout the town, or go directly to the vineyards to sample their wares. The wine bars of Weingut Fredrich Bastian and Weingut Toni Just are the perfect place to experience the best of the region. They offer tastings of individual wines, as well as samplings of a variety of wines. In June, enthusiasts can join the biggest wine party of the year at Weinblütenfest in nearby Steeg. Even if you aren't a fan of wine, you are likely to ingest some wine while in Bacharach. The local riesling is used in cooking traditional foods from marinades to sauces to Riesling gelato (try Italia 76 Eiscafé in town). The appropriately named Altes Haus (old house) really is the oldest building in town. Constructed in 1368 in the typical medieval half-timbered style, it escaped a fire that destroyed many of the other buildings at the beginning of the 19th century. It also just might be the best restaurant in Bacharach. A medieval interior is the perfect setting for German classics like rotkohl and schweinshaxe. Pictures on the wall show how little has changed over the years at Altes Haus. You don't necessarily need to climb to the castle to get a great view. The Postenturm (post tower) is just north of Bacharach and offers incredible views of the river and town. Dating back over a century, it was renovated in the 21st century and opened to the public in 2005. It is an easy uphill walk through the vineyards to the tower and a short climb to the top. There is a small fee for entry. In this small town, Protestant Kirche St. Peter can be seen throughout as it sits in the heart of Bacharach. Begun in 1100, it was completed in the 14th century and its red and white tower pokes toward the sky. Inside, note the alter with stunning frescoes. There are also panels depicting Martin Luther and the Reformation since its 500-year anniversary in 2017. Also watch out for the bizarre, small statues of a frog man and woman with serpents biting her breasts. If you prefer to take things slower than by boat or by train, you can walk the Rheinburgenweg (Rhine castles trail). It follows the west bank of the river and wanders past castles and through vineyards. Revel in unparalleled views of the UNESCO World Heritage Site valley on this elevated trail. Follow the red R signs from Bingen to Rolandsbogen (a city south of Bonn). It was opened in 2004 and is designated as a Qualitätswegs Wanderbares Deutschland. Take the Rheinburgenweg south as it is less steep than going north. The path is manageable even for casual walkers with only a few rocky sections. You can traverse most of the trail with basic footwear, but hiking boots are recommended. It wanders into town about every 10 km so there is no need to pack a lot of supplies. You can sit down for a full meal and a beer at regular interviews.